We generally put a lot more effort into securing our personal computers and laptops than we do our iPad. Whilst it’s true that most computers are easier to hack than a tablet, that doesn’t mean that your tablet doesn’t warrant attention in this area. Many of us use our iPad for internet banking and for accessing our files on the move, both of which mean that we are potentially exposing our personal data. Fortunately, iPads come with plenty of powerful security features, perhaps more than ever with the new iOS 7 update coming, although most aren’t activated as standard. Therefore, let’s investigate some simple tips which can help us to secure our iPad. 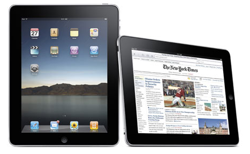 The Apple iPad is hugely popular, yet many people don’t take the steps needed to fully secure it. This is the most basic piece of security, but one that’s often overlooked. A 4 digit passcode ads some security, but this should only be considered basecamp when it comes to securing your device. The potential danger with the four digit passcode comes from finger prints. iPad screens are notorious for collecting finger prints, and there have been reports of thieves tilting iPad screens in order to note down patterns of finger prints around the location of the 4 passcode box. This can give away potential patterns that can help the thief to guess your code. The limitations with the 4 digit passcode mean that its worth opting for a more secure option. Navigate to settings > General > Passcode > set simple passcode to ‘off’. Your iPad will invite you to put in your current 4 digit code. Having entered that, you can then update the password to a longer and more secure option. Remember to follow best practices when it comes to choosing this to ensure that it isn’t easily guessed or cracked. Within the password lock page is the option to set your device to erase all personal data if ten unsuccessful attempts are made on the password. If somebody then tries to access your device, it will delete all of your data if 10 unsuccessful attempts are made. Just make sure that you don’t forget your own passcode. Also ensure that no children play with your locked iPad if you follow this tip. Remote wiping allows you to delete all data on an iPad when its connected to the internet. This is set up via the ‘find my iPad’ settings. For the security minded, its worth purchasing an iPad with 3G connectivity, as the internet connection allows the remote wipe to work at all times. One additional security related tip, is to watch out for fake iPad chargers. We reported recently about the posibility that fake chargers are entering the market, with the intention of stealing your data. As a final tip, ensure you only buy official Apple charging cables. Good security has to be backed up by safe best practices. It’s always worth ensuring that you have different passwords for key areas where you store your personal data, such as Dropbox, your key email account/s and internet banking. The tips presented above are not the conclusive list, but they are intended to provide five actionable ways that you can quickly and easily secure your iPad. Feel free to add any further advice in the comments below, and I’ll update the article accordingly.